Whatever you think of wind turbines as a source of renewable energy, there is no doubt that they all generate some noise. 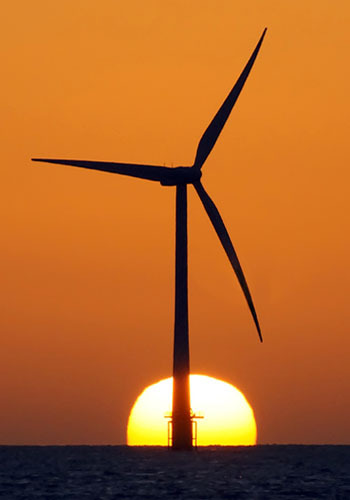 For large wind turbines and onshore wind farms, ETSU R-97 is almost universally adopted in England and Wales. This is a controversial standard which allows higher noise levels than would normally be tolerated from other industrial development. There is pressure on government departments to review the guidance and we are involved in this review process. A robust ETSU R-97 assessment is by no means straightforward to produce as it requires a very good understanding of noise measurement techniques, calculation and interpretation of data. As wind turbines become ever taller, new issues arise with generation and propagation of noise which were not thought of when the guidance was written. As well as undertaking ETSU assessments ourselves, we also review those by other consultants; it is quite alarming how widely they vary. At the other end of the scale, we have undertaken many assessments of noise from micro-turbines for domestic and commercial use. ETSU R-97 does not apply to small turbines, and each local authority has its own planning conditions and noise criteria. Many of these are meaningless because the noise levels specified are simply not measurable at the high wind-speeds at which turbines are noisiest. We have developed a simple, reliable assessment method which has been accepted by all the local authorities we have dealt with to date.